Greenhouse farming in India is gaining popularity fast. One can make a huge profit from polyhouse farming. Greenhouse may seem a costly affair. However, governments provide subsidies. Here is the complete details on greenhouse technology, how to construct a greenhouse and maintain it. A greenhouse or polyhouse can be defined as a house or a structure made of transparent material like glass or polyethylene wherein plants are grown under well-controlled climatic conditions. The size of structure varies from small sheds to industry-sized buildings according to the purpose. Primarily, a greenhouse is a glass house whose interiors grow warmer when exposed to sunlight as the house blocks the greenhouse gas to exit. Therefore, while it may be cold outside the temperature is survival friendly and warm for the plants growing inside. Some greenhouses using high-end technology have installed equipment like heating and cooling system, lighting, screening installations and even computerized facilities to provide optimal growth conditions for the plants. This is done especially to reduce the risks of crop loss in greenhouse cultivation. Greenhouse is made of some kind of transparent material to create a microclimate inside the house. Different materials like glass, wood, polyethylene etc. are used as greenhouse cover to create the microclimate. 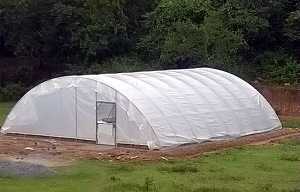 Polyhouse is one type of green house where polyethylene is used as the cover. In India, polyhouse farming is the most popular greenhouse technology for it’s low cost of construction. Lath house is another greenhouse technology where wood is used as the cover. Poly house is economical compared to glass house or greenhouse but the later is more durable than polyhouse. Vegetables: Bitter Gourd, Cabbage, Capsicum, Coloured Capsicum, Cauliflower, Chili, Coriander, Okra, Onion, Radish, Spinach, Tomato etc. Flowers: Carnation, Chrysanthemum, Gerbera, Gladiolus, Marigold, Orchid, Rose etc. The site must be a well-drained area and not a place that has water logging issues. Water logging can cause potential harm to the crops especially in areas with heavy rainfall and floods. The greenhouse must not be built near industrial units. This is to protect the crops from possible pollution effects. Although it should not be placed very near the roads, yet, they must be easily accessible through various modes of transport. Greenhouses being structures for facilitating a controlled cultivation system in greenhouse farming, the structure must allow light penetration and maximum coverage. Hence they are semi-circular shaped structures made of transparent materials like glass, polyethylene and other transparent materials. 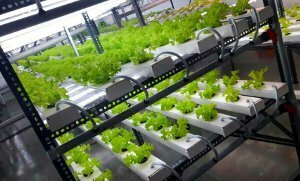 Apart from controlling temperature other objectives of greenhouse farming are maintaining the right carbon dioxide levels, humidity, water, controlling pests and providing plant nutrients. 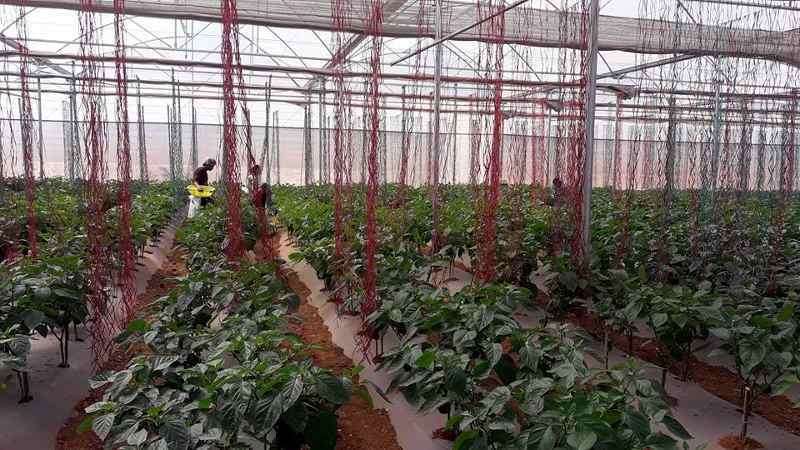 Greenhouse classification is based on different parameters like cost, suitability, structure type, glazing type, number of spans and environmental control. 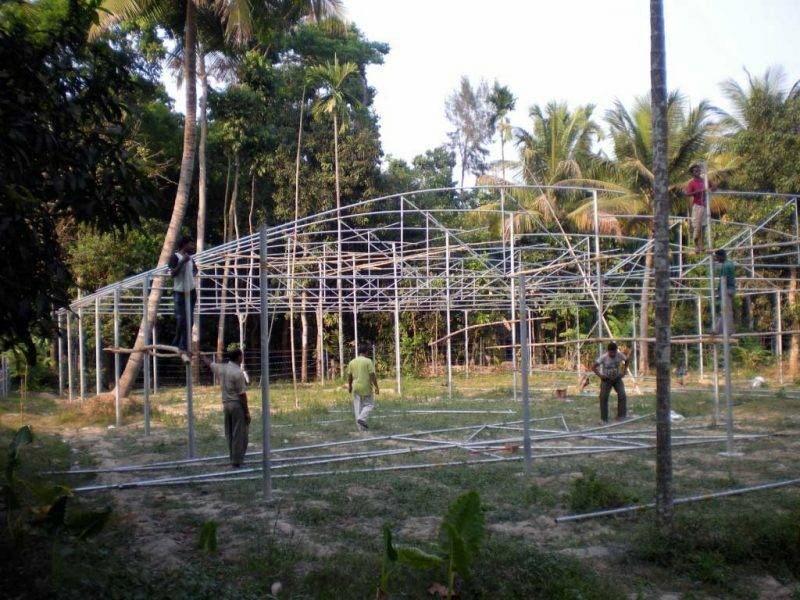 As the name suggests, low cost structure is constructed using locally available materials like bamboo. The light intensity is controlled using nets. For the covering usually polyethylene UV films are used. Simple techniques like side wall opening or closing is used for controlling temperature during summer and winter. They serve as good shelters for rain. This type of structure does not have high technology facilities. It is mainly used in places with cold climatic conditions. The cost for constructing this type of greenhouse varies between ₹ 300- 500 per square meter. Marginal farmers with small land holdings can take the benefits of greenhouse farming using low cost bamboo greenhouse. Some greenhouses are partially controlled with minimum investment conditions. Pipes made of galvanized iron are used for the construction and the canopy is held together with the help of screws. It is lodged firmly in the ground to withstand the wind. There are exhaust fans with thermostat system to control the temperature. There are also cooling pads and arrangements for misting to maintain humidity levels. Such structures are suitable for areas with dry and composite climate. The cost for constructing this type of greenhouse varies between ₹ 800- 1100 per square meter. This type is the most popular greenhouse farming in India. These greenhouse structures are installed with devices to control temperature moisture, humidity and other environmental parameters. The cost for constructing this type of greenhouse is approximately ₹ 2000-3500 per square meter. This type of greenhouse is used for very high value crops and hydroponics in commercial greenhouse farming. The main category of classification is based on the type of material used for support such as PVC frames, steel supports, etc. The material used for fiberglass reinforced plastic glazing can be plain sheet or corrugated sheet. The plastic films used can be silpaulin or UV stabilized low density polyethylene. This is the most popular covering material for greenhouse farming in India. Naturally Ventilated Polyhouses- The structures have good ventilation systems to prevent basic weather and natural damage. However, they do not have any additional provisions to control the environment in polyhouse farming. Environmentally Controlled Polyhouse- This type of greenhouse is basically constructed for off-season production. Factors like light, temperature, carbon dioxide levels, humidity, etc. are controlled. Shade houses are yet another type of greenhouse used in plant production during summers or in warm climate areas. They are commonly used for growing ornamental flowers like Azalea, Hydrangea, Orchids, fruit and vegetable nurseries etc. in summer. 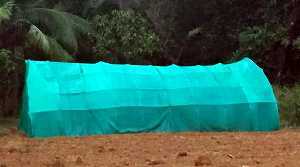 Shade nets made of polypropylene of different colors like black, white and green are used. However, black is the most preferred one since it retains the outdoor heat inside the structure. Dead Load- It is the weight of all the equipment fixed on the frame such as water pipes, service equipment, heating and cooling systems, cladding and the weight of permanent constructions. Live Load- A greenhouse is devised to carry a maximum weight of 15 Kg per square meter. In addition, the roof members must be capable of supporting shelves, hanging baskets, people, etc. Wind Load- The structure must have the capacity to withstand 50Kg per square meter of wind pressure. Snow Load- This is considered in areas having snowfall. In case of snow fall, the structure must be able to bear all the different loads in addition to the snow load. The orientation of greenhouse depends on the shadow movement, shading effect, type of temperature control, wind direction and latitude. In case of other greenhouses nearby, the orientation should be such that its shadow does not fall on other greenhouses. For this purpose, they are oriented in an East to West direction. 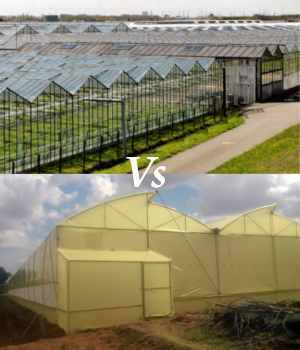 To decide the dimensions, a host of factors like size of the greenhouse, wind effects, height, spacing between the greenhouses and its structural design must be considered. The length of the greenhouse must be perpendicular to the direction of the wind. In case of fan and pad arrangement, the direction of natural wind must be the same as that of the air blown by the fan. A bigger greenhouse would have more temperature build-up especially if there is no proper ventilation. In case of naturally ventilated greenhouse, the length must not exceed 60m. There should be a distance of 10-15m between two greenhouses. This is to avoid shadow from falling on each other. In addition, the exhaust from one greenhouse must not enter the other greenhouse. A 50m X 50m greenhouse can attain a maximum height of 5m. A taller greenhouse would have larger wind load for the glazing and structure. The structure of the greenhouse must be able to bear all the different loads. Hence, the column, foundation and truss must be designed accordingly. They must follow the guidelines specified by the National Greenhouse Manufacturers Association (NGMA of US) standards. Cladding is nothing but covering of the greenhouse. There are different materials used for cladding a greenhouse such as polycarbonate, polyethylene, fiberglass, UV resistant polyethylene films and Tedlar coated fiberglass. Double strength glass and polycarbonate have a durability of 50 years and require very low maintenance. Polyethylene films require high amount of maintenance but are durable for only few years. Fiberglass is durable for seven years while Tedlar coated fiberglass can sustain upto 15 years. Roof- It is the transparent overhead cover of the greenhouse. Gable- The wall of the greenhouse is called gable which is transparent. Gutters- Gutters collect and drain out the snow and rain water that is gathered between the spans. Column- It is vertical structure that carries the greenhouse. Ridge- It is the horizontal section on top of the roof. Bracings- Bracings are erected to support the structure against wind. Arches- They are the structures that support the covering materials. Foundation Pipe- Foundation pipes connect the structure to the ground. Different types of containers are used in a greenhouse for different purposes like growing plants under controlled climatic conditions, raising the seedlings, growing plants for hybrid seed production and for growing ornamental plants in pots. Using containers increase capacity of the production while reducing the crop time in polyhouse farming. Containers ensure uniform growth of plants and minimum transplantation shock. In addition, it eases monitoring of plants and plant nutrition. Clay Pot Easy water managements and very low cost. Pots are heavy to handle and they dry fast. Single Peat Root penetration is very good. Difficult to separate. Single Peat Pallet Storage requirement is low. Since the sizes are very limited, they require individual handling. Soil block and band It facilitates excellent root penetration. While blocks demand heavy machinery, managing a band is intense labor. Strip Peat Pot Root penetration is very good. Separation is slow. Pre-Spaced Peat Pallet Small sized containers. Do not require media preparation. Since sizes are small, they require individual handling. Pot Easy to handle in field. Available in all sizes and shapes. Difficult to separate. Fiber block They are easy to handle. They have a shorter life. In addition, the root penetration is difficult. Fiber trays They use minimum space. They are hard to handle when wet. Polyurethane foam They are easy to handle and reusable. Using this container needs regular fertilization. Drip irrigation is the best technique for watering the greenhouse plants owing to the small root system. It must be ensured that the water is dispersed at the root area only and that it does not fall on the leaves or flowers. Falling on leaves and flowers may lead to infection, disease spread and even scorching. Water is forced out through the nozzles under very high pressure through the micro-sprinklers. These sprinklers are arranged at a height of 1 foot above ground level so as to ensure that water is dispersed at the basal part of the plants. The chief expense of greenhouse is the maintenance of the transparent films. The biofilm on the walls and roof must be washed periodically since dust settles on them reducing the light transmittance. The greenhouse must be solarized annually. Solarization is done by mulching and the interiors are fumigated. Biological control of insects or installation of insect traps is mandatory in greenhouse agriculture. The pipes and sprinklers of the irrigation system must be cleaned periodically so as to prevent accumulation of microbes that may lead to infection in plants. If following organic farming then extra care should be taken. Since plants are being cultivated under controlled climatic conditions in a greenhouse, it has its own share of problems too. One of the chief problems is ensuring nutrient availability and protecting the plants from deficiency of various minerals like boron, nitrogen, phosphorous, calcium, iron and potassium. Similarly, plants may also suffer from excess of nutrients. Constant monitoring and soil testing is necessary to ensure that the plants get adequate amount of nutrition and grow properly. Greenhouse farming in India may seem a costly and intimidating affair. However, horticultural departments and state governments provide subsidies to encourage polyhouse farming among farmers. Approaching them with a detailed project report containing details like production technology, cost components, margin, etc. would facilitate the process. 6 Acres is a good amount of land for commercial agriculture. If you want professional consultancy service then contact our experts.